You can't neglected at F&S Paradise Resort if your tour is to the Famagusta City. It is located in the city of Famagusta, Northern Cyprus. It is just opposite to the ancient city Salamis and 40 km away from the airport and 10 km away from the harbor which is considered as the deepest harbor presents there. The resort is famous for its outdoor dinner facility present in the side of the pool surrounded by trees. It has 18 bungalows which each and every room has facilities like air conditioning, satellite TV, music systems, hair dryers etc. There is a very big and deep swimming pool other then small children pool. 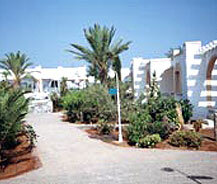 The resort's restaurant provides all kinds of dishes and is famous for its English foods. Definitely it has something for all. The golden sands of the Northern Cyprus are just half a kilometer away from F&S Paradise Resort. You can have a leisure walk on it to add a pleasant feel to your mind. The view of the gorgeous hills, the view of the sun rise and the sun set are a pleasure to watch. The facilities present there will make you say it is a home away from home.